Like the Millerites on the morning of October 23rd I realized that something was very very wrong with either my interpretation of my book or with the book itself. And, like the Millerites, I went back and tried again. And, after the second time around of “What the *$^@*#& is going on here!? !” it didn’t take a prophet to tell me that something had to go. If you’ve been following the posts to far you’ll know that my summer project was supposed to be Chocolate (see “For The Love of Chocolate!“). I’d chosen “Chocolat”, by Stéphan Lagorce, as the book I was going to use as my guide through this vast field of options but I’ve officially changed my mind after this past weekend. (1) Just because it looks bad doesn’t mean it should taste bad. (2) Just because you mess up on one step doesn’t mean the whole recipe is shot. (3) If something goes wrong with a recipe I can almost always pinpoint why and how to solve the problem the second time around. (4) I may not be the greatest cook but I know I’m not THIS bad. So here’s what happened this weekend. My brother had a competition (he’s a champion Irish dancer) up in New Jersey this weekend and the whole family was going. Knowing this was going to be one of the last chances I was going to have with an empty house and the kitchen to myself I decided to stay behind and take full advantage of the situation. I love my family but they really do get in the way of gastronomical progress with all their regularly scheduled meal times and a blatant disregard for marked sanitized areas of food preparation. Obviously, not all of these recipes come from “Chocolat”. I also used one of my old journal recipes, a recipe from my mom’s little blue box filled with index cards, the 2000 edition of Food & Wine, and some recipes I’d found online. Chocolate Truffles – Not using this recipe again. I managed to salvage the truffles in the end but it was not pretty. It calls for too much butter and the chocolate separated and all the butter came to the top. I had to soak up all the butter off the top of the “ganache” with several paper towels before chilling in the fridge. The mousse was just a big fat “Never Again”. A similar thing happened with the butter separating during the melting process and when you mix in the heavy cream the whole thing just goes to *&%@^#. The final product not only has the worst texture ever (even for not mousse) but it tastes oily. I’m just so disappointed in this book I’m not sure what to do. I used a different truffle recipe which turned out so much better, if a little softer than I would have liked. 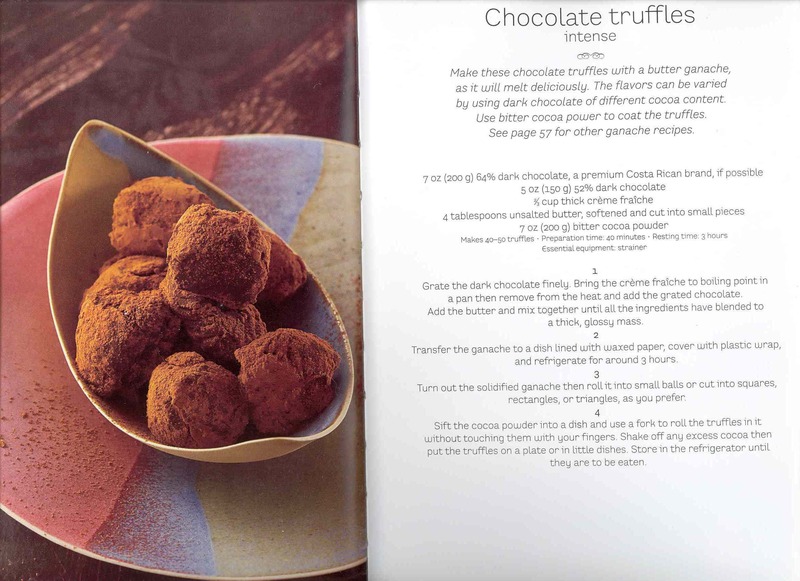 This recipe makes delicious truffles. I love earl grey tea in dark chocolate. It’s one of the best combinations. I tried to use this basic recipe to make a Mango-Ceylon White Chocolate truffle but I forgot how white chocolate reacts with the cream (you need to use a lot less or something) when you try to make a ganache so it’s too soft to be a ganache but it would make a decent sauce or spread. Put 1/2 a cup of the heavy cream and the lemon zest in a saucepan over medium high heat. 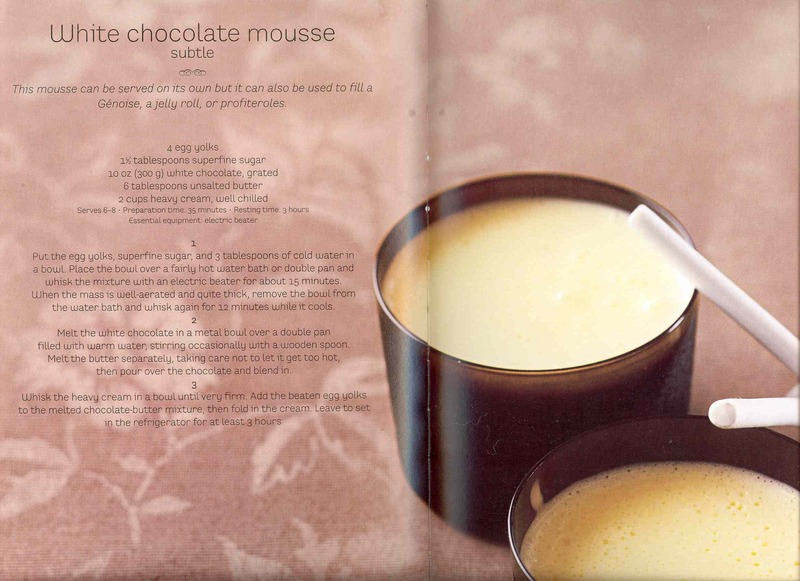 When the cream is warm, add the chocolate and whisk until melted and smooth. Transfer to a bowl and set aside to cool. Put the Mascarpone, the remaining cream, and the nutmeg into a bowl and whip until the Mascarpone is loose. Mix about 1/4 of the Mascarpone mixture into the chocolate to lighten it. Then fold in the remaining Mascarpone. Can be served immediately or chilled to be a little firmer. Back in the day I took one of those “fun” courses in college on journaling. Never regretted it. After doing my journal for the class I decided to do one for the DC are which also ended up being partly a recipe journal. I’d just cut and paste (literally) recipes from various places into the journal. 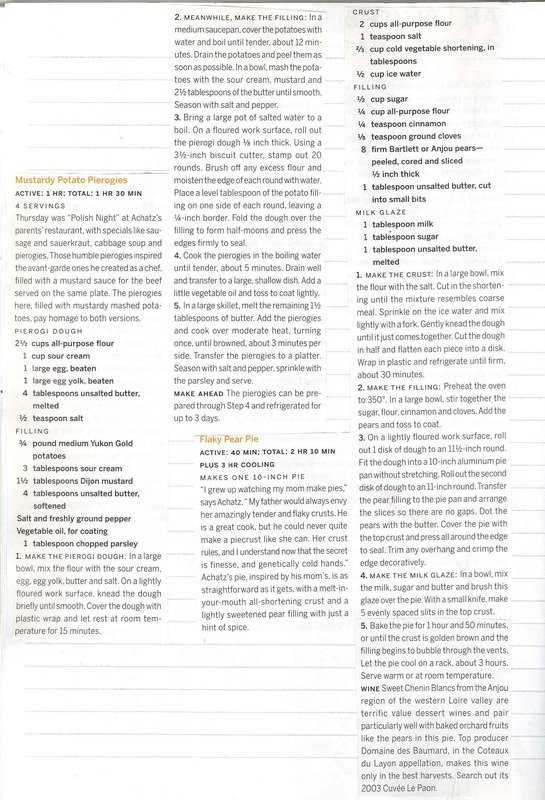 This is the age with the recipes for perogies I tried years ago and decided to give another try. Unfortunately I don’t think my hands are talented enough to get this right because mine come out looking rather unappealing, which is too bad because I really like perogies. The best ones I had, however, were in Poland, and that’s a little hard to beat. We drank the cold pressed coffee with these while watching “Merlin” on Netflix and it was good. To make the coffee just use a french press with the grounds and cold water and leave it overnight. “Press” it in the morning and viola! I made ice cubes with half of it and we drank the rest with a little cream and sugar. Making the Baklava was actually one of the easiest recipes on my List. The only thing that I need to change the next time I make it is to use fresh walnuts instead of what I found in the pantry. The recipe and “How To” video can be found on the June Gastroporn menu. I served it with a Moroccan mint tea. It took forever to make this between all the chilling of the dough (even though I almost never fully chill doughs according to the recipe and they turn out fine for the most part) and the hour and forty-five minutes of baking time. It turned out absolutely beautiful (just like in the photo) and it’s also pretty when you cut through it and can see the asparagus. 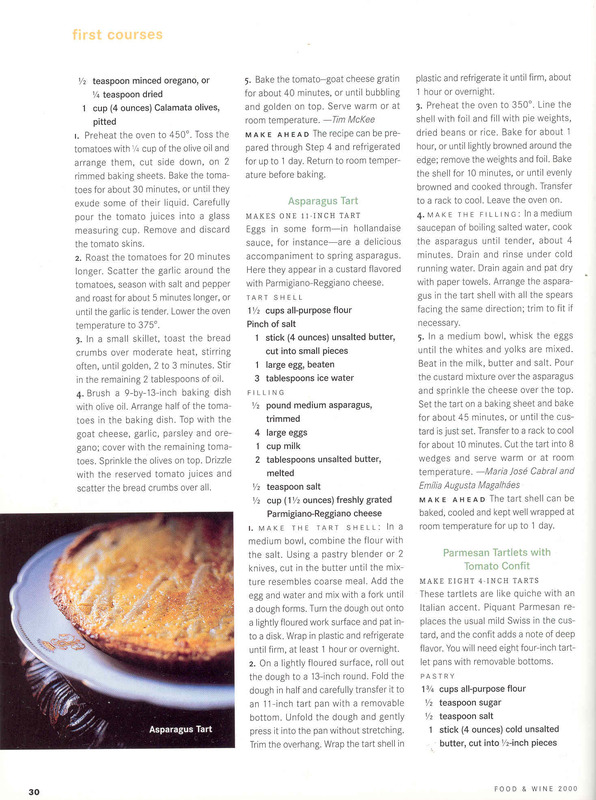 After making the asparagus tart there was some of the egg/milk filling left over so I added a couple more eggs and a bit more milk and used a store-bought pie crust I needed to use that was in the fridge and made an onion tart. All it takes is 4 onions halved and sliced sauteed with some oil, salt, pepper (I put in a good half teaspoon or more to give it a good kick), and a couple teaspoons of sugar to give it some caramelization. Put the onions in the crust, grate some good hard cheese (I have parmigiano reggiano) on top, pour in the egg mixture, and bake at 375 F for about 40 minutes. I took both tarts over to someone’s house after making them and it was a tie between the asparagus tart that took almost 3 hours to make and the onion tart which took one hour (including baking time). I served these with green beans which I sauteed with a couple cloves of garlic in oil, add some salt and a little pepper, the juice of a lemon and soy sauce for a couple minutes before adding in some chopped tomatoes and covering. Cook until the beans are just getting tender then stop. If you keep cooking them they’ll be mushy. Even with all the issues in the kitchen this weekend there was one truly bright spot and it’s the cupcake recipe I tried. 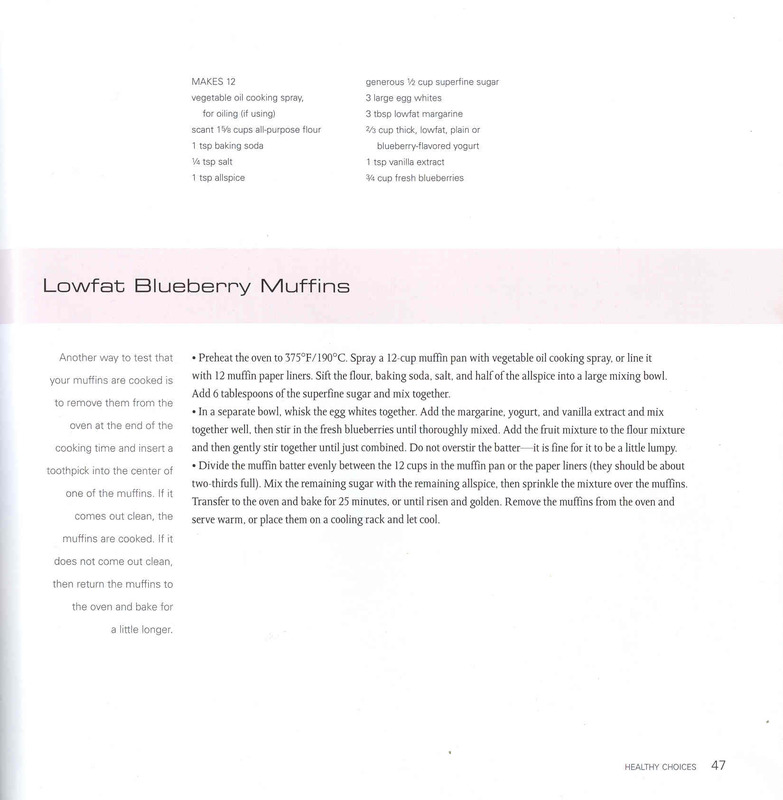 The link to this cupcake recipe takes you to a master page with several other cupcake recipes which I am now more interested in trying after the success of these. This recipe is both easier and more chocolaty (thanks to the Guinness) than the recipe I’ve been using. Ever since Georgetown Cupcakes won the DC Cupcake Wars a few years back I’ve been using a recipe adapted from the winning chocolate cupcake which was printed in the Washington Post. I changed the chocolate ganache icing for a cream cheese icing which I usually flavored with Bailey’s Irish Cream. Sift together flour, baking soda, and salt in a small mixing bowl. Cream the butter and sugar with a mixer in a large mixing bowl. Add in the eggs and continue to beat. Mix the milk and vanilla in a measuring cup. Alternate adding the milk mixture and flour mixture into the butter and sugar. Sift the cocoa powder and add. beat until combined. 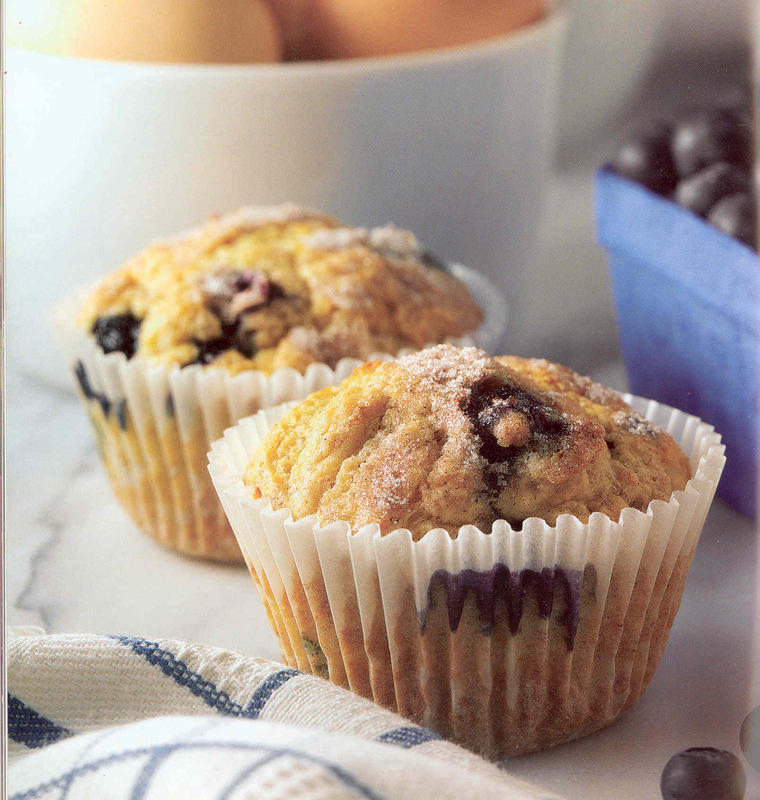 Fill cupcake tins and bake at 350 F for 18-20 minutes or until cooked through. To make the icing, combine the cream cheese and butter and beat until creamy. Add in half the Bailey’s and continue to beat. Add in the powdered sugar about a cup at a time and dribble in a little of the remaining Bailey’s into the mix between batches of the sugar. Be sure to end the process with the sugar. Continue to beat the whole mixture until fluffy.